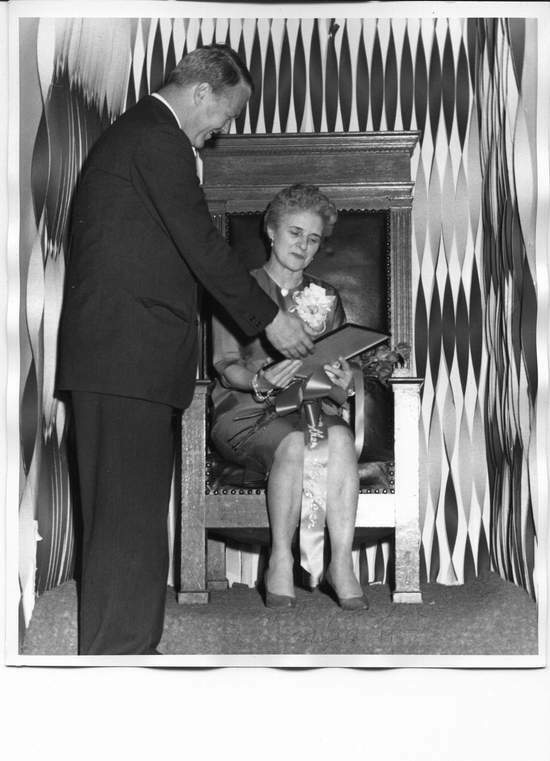 In 1963, VT Governor Phillip Hoff awarded MOM the "Mother Of The Year"
MOM was a beautiful woman and she spent most of her time making everyone look good. She always made POP look great and always dressed him for all the special events at NBC and the Elks. She made dresses and suits for all 14 children, most of the time from clothing that was donated to the family that she would take completely apart, and she must have knitted hundreds of mittens in her lifetime. MOM learned hairstyling before she was married and she did hair-cutting all her life. We got to know many people because of her haircuts. She knew how and when to motivate POP to do work around the house, like when she knocked down the kitchen wall so that POP and Ben would redo it. She just took matters into her own hands. When my family was young, we spent every Sunday visiting MOM and we always had great doughnut's for everyone. She really enjoyed her 69 grandchildren.